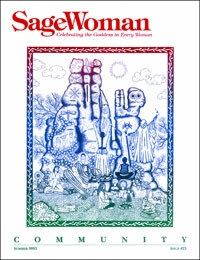 SageWoman #23 (rare) Community [sw023p] - $8.95 : BBI Media - Magazines that feed your soul. This issue focuses on the women's spirituality movement as a community, or, more accurately, as interlocking circles of community. Articles like "Burning Old Lies", "Lessons from Experience", "Beyond Fear", and "Community or Clique?" grapple with issues of inclusion, identity, and leadership among Goddess-loving women. A revisioning of the Goddess Hera and an invitation to engage with the archetype of the Crone round out this fascinating collection of women's wisdom. 64 illustrated pages, published by Anne Newkirk Niven and edited by Mary Barker in summer of 1993.